When I left my graduate school program in history three years ago, my reading choices swung wildly from a steady diet of non-fiction to almost exclusively fiction (and YA fiction at that). One exception to that general rule is food writing. I follow food blogs, I read cookbooks, and I have been known to search out obscure magazines and read the latest volume of Best Food Writing on a whim. 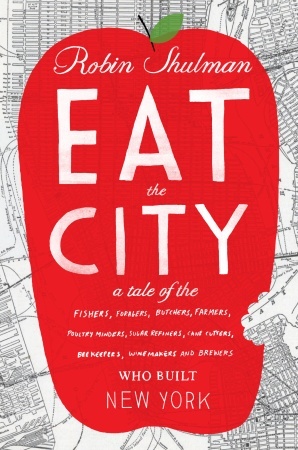 Robin Shulman’s Eat the City: A Tale of the Fishers, Foragers, Butchers, Farmers, Poultry Minders, Sugar Refiners, Cane Cutters, Beekeepers, Winemakers, and Brewers Who Built New York pays homage to food and history and a great, metropolitan city. It was therefore irresistible to me. New York is not a city for growing and manufacturing food. It’s a money and real estate city, with less naked earth and industry than high-rise glass and concrete. Yet in this intimate, visceral, and beautifully written book, Robin Shulman introduces the people of New York City - both past and present - who do grow vegetables, butcher meat, fish local waters, cut and refine sugar, keep bees for honey, brew beer, and make wine. In the most heavily built urban environment in the country, she shows an organic city full of intrepid and eccentric people who want to make things grow. What’s more, Shulman artfully places today’s urban food production in the context of hundreds of years of history, and traces how we got to where we are. Eat the City is about how the ability of cities to feed people has changed over time. Yet it is also, in a sense, the story of the things we long for in cities today: closer human connections, a tangible link to more basic processes, a way to shape more rounded lives, a sense of something pure. With wit and insight, Eat the City shows how in places like New York, people have always found ways to use their collective hunger to build their own kind of city. In Eat the City, Robin Shulman breaks down what would be an insurmountable task (chronicling the history of food production in New York and connecting it to the present) into personal stories, tidbits of history, and deep local research. She takes the tone of a journalist and dives not only into the lives of current New Yorkers, but into the radio, magazines, newspapers and records of the past. Of course, in a city the size of New York, there is no ‘one’ history of food. But Shulman takes the reader on a far-reaching tour that seems as though it must touch every corner, and the result is a new appreciation for food and its varied history, and for what human beings can do in an urban environment. Shulman creates a personal connection between the reader and food history, and allows a look into past lives through creative description and research. That descriptiveness, while at times overdone, often put the reader IN the scene – in the butcher shop or on the rooftop. That is no mean feat. Eat the City should appeal to all readers, because food is universal. That said, it will appeal most to foodies, hipsters, and anyone with a connection to the food chain in New York, even if it is just a delicious meal in one of the neighborhoods that Shulman mentions. The ‘chapters’ on honey, meat, vegetables, fish, sugar, beer, and wine make for accessible reading. The narrative as it is, typically focused on one person in the present combined with many lives in the past, connects present reality and a world stretching hundreds of years into the past. Though I enjoyed the book and found its many stories delicious, uplifting and astonishing by turns, I found that some sections were stronger than others. Honey and vegetables were two robust chapters, while the one on fish came off a bit as preachy, and parts of wine sounded to this ear like an old man’s tall tale, undiluted. In addition, I was a little bit dismayed to see that this history of New York’s food production is, overall, a man’s story. I can’t help thinking that there must be more women’s stories in the city, and I was dismayed to see the central lives and focus given solely to men. Recommended for: foodies, food historians (amateur or otherwise), urbanites, devoted New York City residents or those who merely curious, and anyone with an eye and ear for description and a taste for food. So, basically, everyone. Fine print: I received a copy of Eat the City for review. I'm also a sucker for food writing. It's the one type of writing I can enjoy aside from YA/Adult fiction. I just read this book last week. I love nonfiction and I love to read about food and I love to read about NYC, so it was a perfect book for me. Weekend Cooking: Paris in July. Hope you will stop by! Alissa: I don't know what it is about food writing, but I'm glad I love it. I always end up so inspired to find new things and experiment. I'm glad you like it too - I think you'd love this book! Deb: Yay! Glad you liked this one. It was pretty stellar. Very interesting post. Have a great week. *TBR tower stutters under new weigh* Well THANKS. Nice review! Also: can we be food buddies? The joys of good food done well and eaten in company are lost on my family. My kingdom for a brunch, is what I am saying. What an interesting way to look at things -- not really obvious that New York would have a book's worth of stories about food production. Sounds like a lot of great stories in the book about the New York food scene. Sounds like something I'd like to read, I enjoyed the review! I haven't started on this one yet, but hope I can get to it pretty soon. Oh my. This is sooooooo my kind of book. Can.not.wait. to read it. Sorry it took me so long to visit your post. We were out of town and didn't have Internet access.